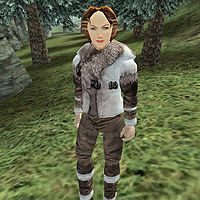 Fryse Hags are respawning female Nord NPCs, powerful and savage witch spell casters that are randomly placed in the wilderness. They can drain your Strength, often summon an Ancestor Ghost or Greater Bonewalker and wield an enchanted weapon. All in all, this versatility can make them an annoying, if not quite deadly opponent. There are three variants in existence on Solstheim. 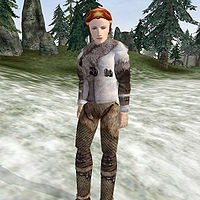 Fryse hags share most of their equipment with Smugglers, but of particular note is the Winterwound Dagger, carried by types 2 and 3, which does 100 pts Frost Damage. Fryse means to freeze in Danish and Norwegian; a hag is a witch, especially one in the form of an ugly old woman. "Fryse hag", thus, means something along the lines of "frost witch". If you play as a Werewolf, Fryse Hags make accessible, respawning prey. This page was last modified on 23 November 2018, at 07:32.